This surgical procedure is performed to give more volume and a better shape to the breasts, by placing breast implants. When evaluating the possibility of a breast augmentation, for precaution it should be investigated if the company that makes the implants complies with the quality and security programs that the ANMAT requires (the State agency that regulates medicines, foods and medical technology); and if the distributor in Argentina has the corresponding approval. Another issue of utter importance to consider when facing a surgery of this type, consists in the correct selection of the surgeon who will perform the operation. The ideal is the surgeon to be a specialist in plastic surgery. It is strange to find patients who undergo surgeries, like breast implants placement or other aesthetic surgeries, performed by doctors who haven´t had a formal training in plastic surgery. It is important to verify that the treating doctor is Certified by the Argentian Society for Plastic, Aesthetic and Reconstructive Surgery (SACPER). If this is the case, it is guaranteed that the attention is given by a specialist who meets the qualifications demanded by their peers, in terms of knowledge and professional training. This means that the plastic surgeon is apt and up to date. Although a certified plastic surgeon cannot assure a 100% good results and the total absence of complications, it is with no doubt, the safest option to obtain optimal results and to face any complications, in case they might happen. The plastic surgeon will have to inform the patient about the different kinds of implants, their surfaces, profiles, designs, origins and sizes available. He will explain the different possible boardings (incisions which to insert the implants through), pros and cons of each of them, and also the possible placement of the implants (behind the mammary gland -submammary- or behind the pectoral muscle -submuscular-). He will be able to advise with aesthetic judgement, on the optimal implants´ size to improve body harmony; the necessary pre-operative studies, type of anesthesia to use during the surgery, evolution and post-operative controls. All this information will enable the patient to make a suitable election and therefore optimize the results. The most used in Argentina are the silicone gel implants. They were developed at the beginning of the 60´s and since then, millions of women worldwide have benefited with their placement. The implant has an silicone envelope (shell) and a content of the same material, yet of a gelatinous consistency. This kind of implant is the closest to mimic to the mammary gland. Therefore, it is the one to obtain the best aesthetic results with. 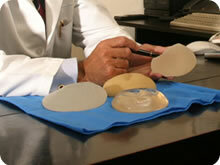 Breast implants´ surfaces can be either “smooth” or “textured”. There is a vast experience with the smooth surface implants. Nowadays they are still in use, although they are practically left for submuscular insertion (below the pectoral muscle). This is because with the subglandular placement (underneath the mammary gland and over the aforementioned muscle) there are more possibilities of developing a retractable fibrous capsule(“hardening”) than with the textured implants. Textured surface implants are preferred for subglandular positioning. They have a low “capsule” incidence and it´s several years since they are used massively. Implants can be placed as well on a subfascia plane, over the pectoral muscle, but below its aponeurosis and the mammary gland. Since several years it is being used the “cohesive” gel (the inner gelatin of implants), which diminishes even more the migration of the implant´s contents through its shell. There also exist implants with a “polyurethane” cover and filled with gel and others with silicone cover (smooth or textured), but filled with sterile salt water (saline). Why are saline implants much less used in Argentina? The implants filled with saline have some disadvantages compared to those of silicone gel, such as having a firmer consistency, leaving the breast with a less natural look and feel. If they are filled to the maximum, the look firm, spherical and unnatural. On the contrary, if they are filled “in less”, they look more natural, but it is probable that they “translate” or “copy” onto the skin, the folds or rippling of the insufficiently filled implant. They may also (in a low percentage, though) lose part or all of their content if their valve fails (deflation). Where are breast implants inserted and placed through? The most common insertion routes for breast implants positioning are: periareolar, inframammary and transaxillary. The election depends basically on the patient´s preference, even though some limitations exist, such as the areola size, the plane where the implants will be placed in, if there is mammary ptosis (drooping breasts), the risk of disabling the execution of specific studies for breast cancer like the “sentry ganglion”, etc. Infrequently they can be inserted through the abdomen, in the occasion of combining this procedure with an abdominoplasty or by means of instruments specially designed in case of using saline implants. It is a decision we make together with the patient. The breast augmentation surgery can be performed under local anesthesia, plus a sedative provided by the anesthesiologist. After a few post-operative hours for recovery, the patient can go home. The alternative of general anesthesia also is available. During the first immediate 24 / 48 post-operative hours it is probable that some pain or discomfort in the treated area may exist. For this, analgesics are indicated. After this period, the evolution is very well tolerated. Usually we leave a compressive bandage for 3 to 5 days. The possibility of complications is the common to any other surgical procedure: hematoma (bleeding, bruising), seroma (swelling), infection, exaggerated, hyper or hypopigmented scars, etc; in addition to other risks particular to this kind of surgery: alterations of the breast or the areola-niple set sensitivity, fibrous capsule or implant rupture. In multiple studies it was proven that the number of general complications was inferior to those in other surgeries like: hysterectomies, mastectomies or appendectomies. Nonetheless, there is a more or less significant percentage of revision surgeries, motivated by a capsular contracture or performed to obtain a better aesthetic result. Capsular Contracture? What is it? A capsular contracture consists of a heavy, fibrous and constrictive scar which forms around a breast implant. This condition causes the breast to look firmer and harder than expected and with a spherical appearance. Sometimes there is pain added. The magnitude of this problem varies from patient to patient: from a slight firmness of the breast that doesn’t affect its form in some cases, to others in which it produces discomfort and requires a revision surgery. What is the rate of breast implants rupture? In regard to the possibility of implant rupture it must be noted that the companies which produce breast implants, produce them under strict standards of resistance to compressive and extreme usage during a prolonged time span. However, they might not be considered indestructible. Thoracic trauma or breast injury may increase the possibility of implant rupture. There is no evidence to sustain that the compressive maneuvers practiced during mammography studies increase the chances of rupture. The percentage of breast implants rupture is not known accurately. Old implants, have a rupture rate greater to modern ones, due to a thinner shell and a more liquid gel content. The possibility of implant shell failure, it is believed to increase progressively with time, specially after 10 years of placement. How does a patient with implants realize that she has a broken implant? Any change in the shape, size or sensation of the breast, can represent a sign of rupture. If any of these things happen, the patient must consult his plastic surgeon to be examined. A mammary ecography is an excellent study for the detection of ruptures. A computerized tomography offers good information too, but it requires a dose of radiation exposure that is not recommendable. We do not recommend a mammography if there is a suspicion of broken implants. The nuclear magnetic resonance doesn’t use x-rays, so it is probably the more suitable complementary study. A high number of patients with a broken implant don´t show symptoms, the habitual mammography doesn’t manage to detect the rupture either and the gel remains within the capsule that the body has made without significant consequences. These cases become evident when we make a revision surgery to a patient to change implants or because of a fibrous capsule. How to proceed in case of an implant rupture? There´s a general agreement that broken implants must be extracted. A revision surgery is recommend, to remove the implant in conjunction with its surrounding capsule. Breast implants placement has been performed for more than 40 years. During all this time no scientific evidence exists that can link breast implants to cancer. There are medical studies which compared the incidence of breast cancer in populations of women with and without implants, verifying a similar or even smaller rate of cancer in women with implants compared to those without. This doesn’t imply, however, that there may be a protective characteristic in the implants against cancer. Some specialists think that the presence of implants might delay the early diagnosis of cancer, since they are opaque to x-rays. For this, with the application of the Eklund technique, and in absence of significant capsular contracture, a good radiologist can achieve satisfactory images for a suitable monitoring of mammary problems. What does silicone migration consist in? Multiple studies presented in the last ten years by universities worldwide, demonstrate the lack of relation between silicone gel breast implants and connective tissue disorders (which had been linked together in the past). Likewise, the quality and security standards of breast implants have improved significantly. In newest implants still a greater impermeability has been achieved, by using “cohesive” silicone gel. The resistance of the implant shell has also been improved. It must be remembered that silicone is a substance habitually used in several implantable devices in the human body, because it is one of the biomaterials with less reactivity known. It is applied to drainage, joints, artificial pumps, pacemakers; testicular, cheek, chin, pectoral, gluteal and mammary implants. It´s part of many medication caps (to make its swallowing easier) and it is used to lubricate syringes, needles and tubes of intravenous usage. It is also used in the industrial processing of lots of foods, cosmetics, medicines (specially antacids). Any individual who has donated blood or received an injection, has received some silicone in their body. We all have a certain level of circulating silicone in our bloodstream. However, there is no evidence of allergy development to silicone. Even though antibodies to it have been detected, this is not synonymous of disease. It only translates as the answer of our immunological system to the presence of an alien body. Migration of silicone contained in a breast implant refers to microscopic amounts of silicone that can trespass the implants´ shell and generally remain contained in the capsule formed by the body around the implant. Migration has been reduced drastically by perfecting the implants´ covers and with the usage of cohesive gel.